These are the settings we used to calibrate the Samsung 55 inch UN55NU7100 TV and we expect them to be valid for the 40 inch version (UN40NU7100), 43 inch version (UN43NU7100), 49 inch version (UN49NU7100), 65 inch version (UN65NU7100) and 75 inch version (UN75NU7100). These are suitable for any content, from watching movies to TV shows and gaming. For Gaming, some adjustments need to be done, and they are listed below. 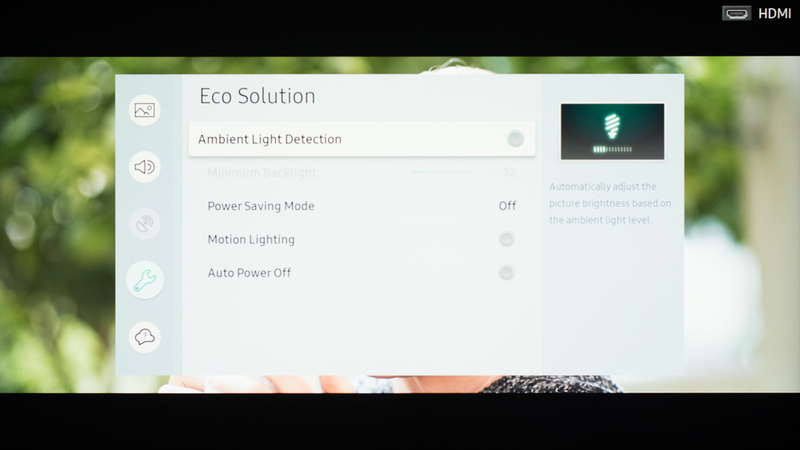 The first thing we did was to turn off all of the 'Eco Solution' settings since we didn't want the backlight level or picture settings to change during our calibration. This is recommended if you don't want the brightness of the TV to change automatically depending on the room brightness. 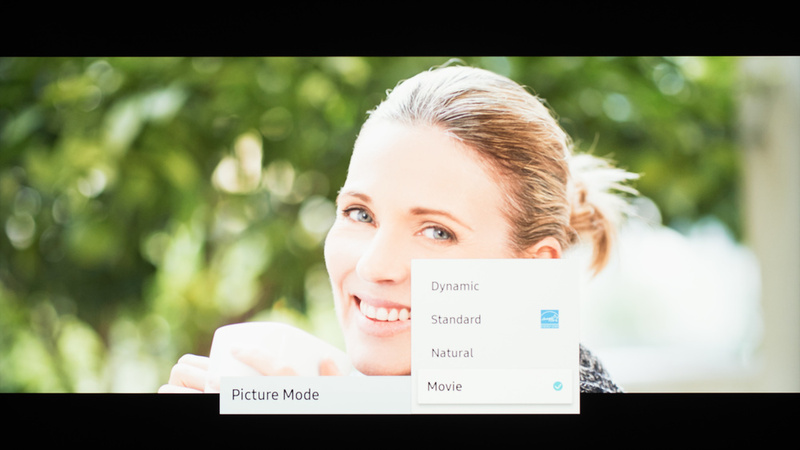 For movies and TV content, the 'Movie' picture mode gave us the closest results to our calibration goal and it should bring the image quality closest to what the content creator intended it be. A 'Backlight' setting of 21 gave us a luminosity closest to our calibration target of 100 cd/m². Most people will find this too dim and should adjust it. Note that adjusting the backlight setting has no impact on picture quality. We left the 'Brightness' to 0, 'Contrast' to 45 and 'Sharpness' to 0. We also left "Color' to 25 and the 'Tint (G/R)' to their default values of 'G0 and R0'. We turned off 'Digital Clean View', If you are watching older, low-resolution content, you may want to set it on to make the content smoother and with fewer compression artifacts. For our calibration, we left the 'Auto Motion Plus Settings' Off. 'Contrast Enhancer' was also left turned off since we don't want to add any extra image processing to keep the content as faithful to the original intent. The 'Auto Motion Plus Settings' control the NU7100's motion interpolation. Since it has a 60Hz panel, it can only interpolate 30 fps content up to 60Hz. To do so, set 'Auto Motion Plus' to 'Custom' and increase the 'De-judder' slider to your liking to add more or less soap opera effect. The gamma setting adjustment was set to BT.1886 +2 (updated on 04/19/2019 from BT.1886+1 before) since it was the closest to our calibration goal. The TV will automatically set the Gamma type automatically depending on the content. You should only adjust the gamma curve with the slider (plus or minus) if you find there is black crush or if dark scenes are not deep enough. In the 'Color space' setting, it is preferable to leave it to 'Auto'. 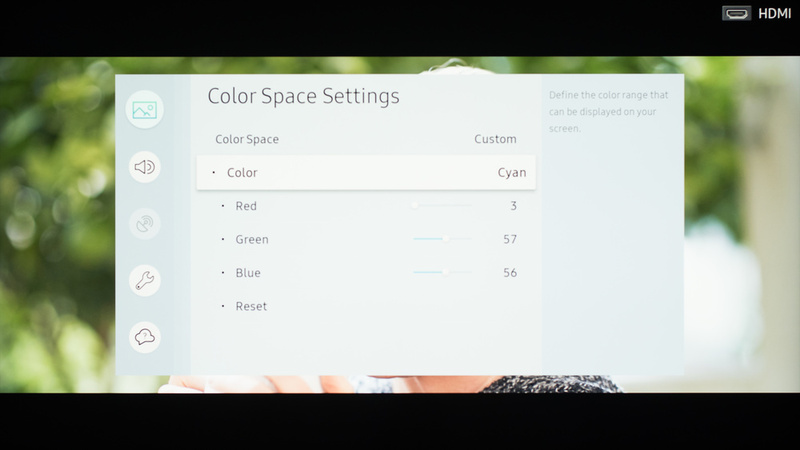 When set to auto, the color space changes to match the type of content you are watching automatically. 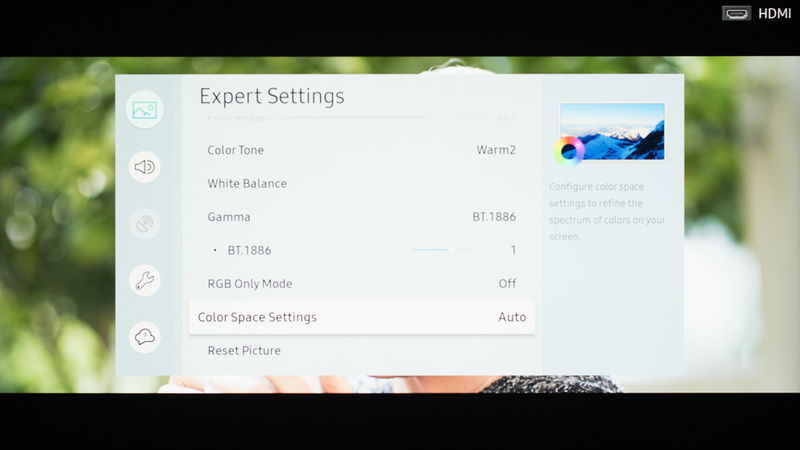 Setting the Color Space to 'Custom' will allow calibrating the TV for SDR content. If you set the Color Space to 'Custom' you will have to adjust the settings each time you change from SDR to HDR. For use as a PC monitor, PC Mode can be enabled by setting the Device Type to PC from the Input Device Manager submenu in the External Device Manager menu. For proper chroma 4:4:4 support, HDMI UHD Color must be enabled for the port. When in PC Mode, a Sharpness setting of 10 is the default neutral setting. It is not possible to add sharpness, instead decreasing the setting will soften the image. For watching HDR content via an HDMI connection, it is important to set the 'HDMI UHD Color' on for each HDMI input that will receive the HDR content. This will permit the HDMI port to transmit all the bandwidth needed for HDR and tells the TV to expect a 10-bit color signal on that input. If the 'HDMI UHD Color' is not turned on, some devices will not detect the NU7100 as being compatible with HDR. For HDR content, it is also preferable to set the 'Backlight' to maximum and set the 'Color Space Settings' to 'Auto'. To enable Game Mode, select 'External Device Manager' from the 'General' menu, and then select 'Game Mode Settings'. Set 'Game Mode' to 'On'. It is recommended to set the 'HDMI Black Level' to Auto. For SDR gaming set 'Sharpness' to '0' to remove any sharpening. To enable chroma subsampling when playing from a PC, set the device icon to 'PC' under the 'Input Device Manager' submenu. For HDR gaming apply the same HDMI settings mentioned in the HDR settings and game settings above. Note that when in game mode, the TV won't change the backlight setting automatically, so it is preferable to set the backlight to max.